This is only recent history, but I was thinking about the number of grocery stores that have closed down in Athens in just the last few years, usually replaced somewhere else but still causing suburban eyesores and inconvenienced customers. Winn-Dixie stores at the Willowood, Alps Road, and Homewood shopping centers have all closed down. The Alps Road site was replaced by a Kroger with a new building on the same spot, but this Kroger was essentially a move by the West Broad Street Kroger which closed and left space now occupied by the Omni Club gym. The Willowood area is still served by the Wal-Mart Supercenter on Lexington Road (which may have eroded Winn-Dixie's sales). Bell's grocery near Willowood closed down and its building was demolished to make way for Lowe's Home Improvement. Harris Teeter at Beechwood (across from the Alps Road Winn-Dixie) also closed, and although the immediate area is now just served by one store rather than three, the west side of town is now served by a new Kroger and Wal-Mart Supercenter in Oconee County on Epps Bridge Parkway. The Bi-Lo stores were replaced by an outfit called Southern Family Markets, but they soon closed the South Milledge Avenue location. That closure leaves a gaping hole in grocery market coverage. The Homewood closure also seems to an inconvenience, according to a writer of a letter to Flagpole. I suppose this is all a result of tight margins and tight competition. Businesses must make good decisions to stay in business, but neighborhoods suffer the externalities of losing a convenient store and having a new abandoned eyesore nearby. Our planning process should encourage the rebuilding of current shopping centers and discourage landlowners like Wal-Mart from allowing them to stay empty. Of course, Athens-Clarke is a small county, and if we say no then the grocers, retailers, and developers go to Oconee County where they say yes. But how long will Oconee County encourage this kind of growth? 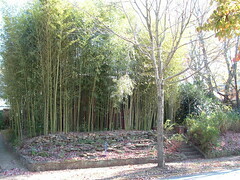 Jonathan Railey remarked about this Grady Avenue bamboo stand last week in his article on the Georgia Guidestones in Flagpole. He was speaking of "roadside oddities of peculiar origin that dont really fit with their surroundings in any conventional way," placing this bamboo in a category with the Georgia Guidestones, the Iron Horse -- and the Tree That Owns Itself. So this bamboo is considered an Athens landmark. It needs a name. Maybe it should be the Bamboo That Owns Itself, or even better -- the Bamboo That Owns Its House, considering its dimensions. It's a landmark connected to an Athens institution since it is in front of a house owned by Michael Stipe (I'm not sure which one). Our Daily Bread is the soup kitchen for the needy operated by Athens Urban Ministries at the Oconee Street United Methodist Church. For many years they have served lunch on weekdays, and nowadays they serve breakfast too. According to an article last year on Online Athens, they also now offer sack lunches on Saturdays and sack suppers on Sundays, and they don't require proof of eligibility to serve. When the guests show up for lunch they are given numbers, and numbers are called out as plates are served and seats are vacant. Members of several area churches volunteer to staff the kitchen, and it appears that their friendly efforts are much appreciated. It gets called a soup kitchen, though I haven't seen soup served there. They serve things like macaroni-and-cheese and ham, and the food looks a lot healthier than what I often eat for lunch. As you would expect, the guests are different kinds of people with different backgrounds. Some are regulars while others show up when their finances are in a pinch; some are homeless, some are not; some are jobless, some are not. Perhaps I'll learn more about the operation of this place. Someone tried to obtain oxycodone with a fake prescription yesterday from CVS Pharmacy at the Beechwood Shopping Center, according to Athens-Clarke County Police. This pharmacy had been alerted by another pharmacy, so they called the police when this person showed up. He was still in the pharmacy when they arrived, so he was arrested. I used to work as a store clerk at that CVS, and I was aware that the pharmacists were on the lookout for forged prescriptions. One time a forger got away when they called the police because he or she saw them come through the front door before the pharmacist could talk to the police and identify the person. One day I was asked to be ready to call the police on a forger, and I was to ask them to come to the back door in order to be able to surprise the suspect. We had a code prepared: The pharmacist would announce through the intercom, "Customer service on line four." Yes, just like in Chuck Palahniuk's book "Choke," there actually are secret codes given over intercoms. Well, nothing happened that day, so I didn't get to see any action. Not needing police action in your store is a good thing, though. However, a couple of weeks later a pharmacist really did announce, "Customer service, line four." I called back there and asked if they needed help, and they said no. It turns out there really was a line four, and it really needed customer service, even though I thought there were only three lines. I imagine it's pretty hard to get narcotics with a forged prescription. The doctor has to write some kind of Drug Enforcement Agency number on the prescription for certain drugs, so there might be a lot of clues for a pharmacist to check.